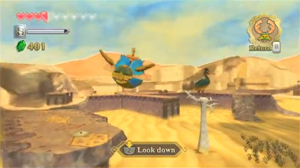 Below, you'll find a complete listing of Skyward Sword Enemies, listing each of the enemies that have been seen within screenshots and trailers of Skyward Sword. The Skyward Sword Enemy Guide listed below is incomplete and will be updated as more information becomes available. For full context of where Link encounters each of these Skyward Sword Enemies, be sure to take a look at our Skyward Sword Walkthrough. 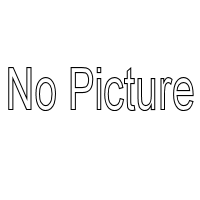 In the case of some Skyward Sword Enemies, they will be listed here at the Skyward Sword Enemy Guide as well as over at the Skyward Sword Boss Guide. Ampilus is a desert-dwelling enemy that looks much like a hermit crab; it will attack you by rolling across the sand on its hard shell. Its body is electrified, and inside of its hard shell is a crab. When Ampilus stops moving, you can walk up to it and slash the head with your sword to kill it. After a few seconds, the shell of Ampilus will explode, and a new Ampilus will crawl out of the sand to take its place. Read More about Ampilus at the Zelda Dungeon Wiki. These small one-eyed scorpions are found in the Lanayru Mining Facility. They are baby scorpions, resembling the boss of the Lanayru Mining Facility, Moldarach. They will attack by jumping on a body part of Link and biting him. They can be defeated by every damaging weapon in one hit. Aracha will sometimes leave behind a Jelly Blob when defeated. 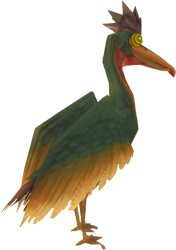 Read More about Aracha at the Zelda Dungeon Wiki. Armos are statues found in the Lanayru Mining Facility. To defeat them, you must use the Gust Bellows to spin the colored screw on top of their head, opening their mouth. From here, you can slash the crystal inside their mouth, or place a bomb inside to kill them. 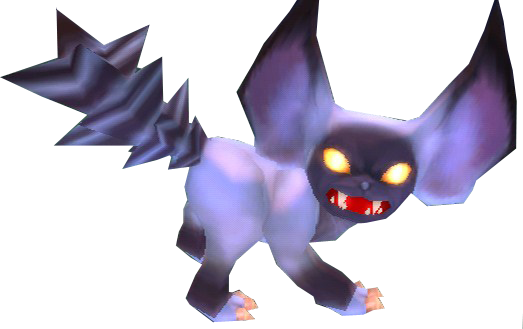 Read More about Armos at the Zelda Dungeon Wiki. Beamos are multilayered totem-pole like objects that are made up of different electrified parts. These enemies can be defeated by slicing apart different sections of their body. The beamos will shoot out a laser beam from its eye, but this attack can be deflected using the shield. 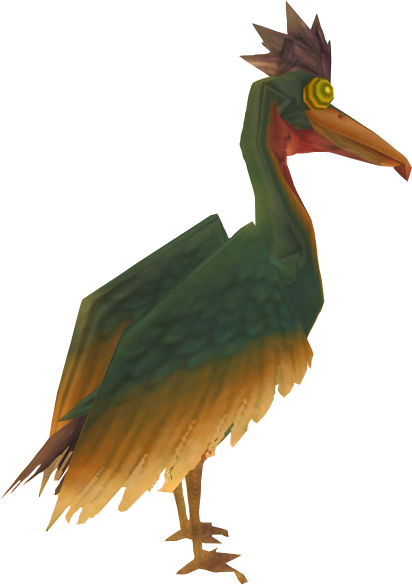 Read More about Beamos at the Zelda Dungeon Wiki. Blade Traps are razor sharp enemies that will dart at you once you move near the edge of a room. You can easily dodge them by walking near their line of sight and wait for them to attack. When they move to the other side of the room, quickly run past them. There is no way to destroy them. Read More about Blade Trap at the Zelda Dungeon Wiki. Bokoblin Archers can be found patrolling the Summit of Eldin Volcano and the Fire Sanctuary. Archers come in both Green and Red colors, and can be easily defeated with arrows from a distance, or the sword or bombs if you get close. 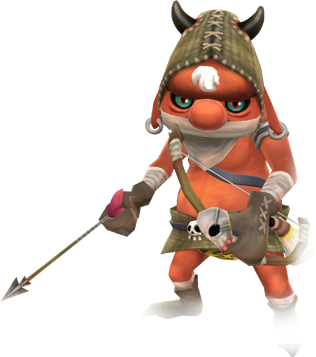 Read More about Bokoblin Archer at the Zelda Dungeon Wiki. 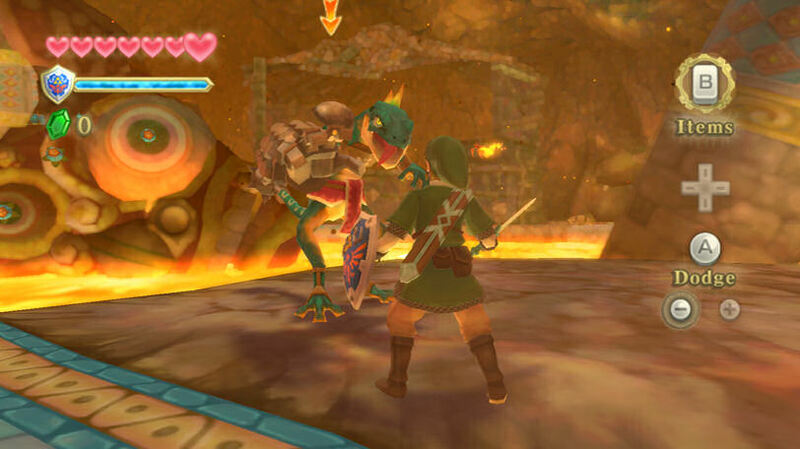 Read More about Bokoblin Archer (Green) at the Zelda Dungeon Wiki. These Bokoblin act much like their other kind, except they are colored blue. They can be found in Faron Woods only after completing the area for the first time. 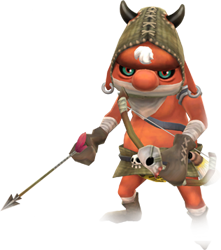 Read More about Bokoblin at the Zelda Dungeon Wiki. These harrowing foes are encountered in the dark and dirty underground catacombs of the normally pristine Ancient Cistern. They will rise out of the ground, usually in large groups. They can't be defeated with a regular sword, unless the fatal blow is used. Until you receive a more powerful sword or use one of Koloktos' swords, it is better to simply avoid them. 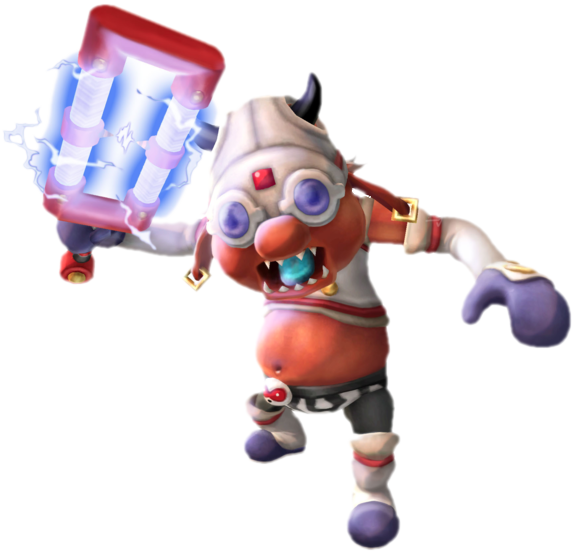 Read More about Bokoblin (Cursed) at the Zelda Dungeon Wiki. Green Bokoblin wield large hammers rather than the swords of their red counterparts. 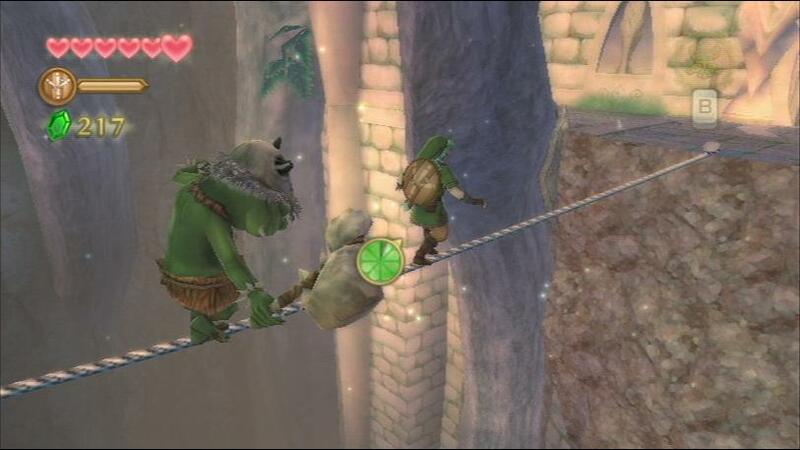 Some bokoblin can be found walking along tightropes. To defeat these foes, you can either use the motion plus controls to shake the tightrope while walking; or drop down, and while hanging on the rope, shake it to make the Bokoblin fall off. The Green Bokoblin will most likely be encountered on the ground as well, where his hammer is more of a threat, and you will need to use traditional methods to defeat them. 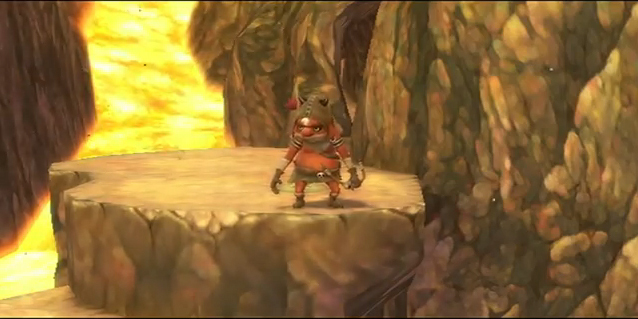 These Bokoblins look much like regular Bokoblin except for the hat they wear, which signifies their status. 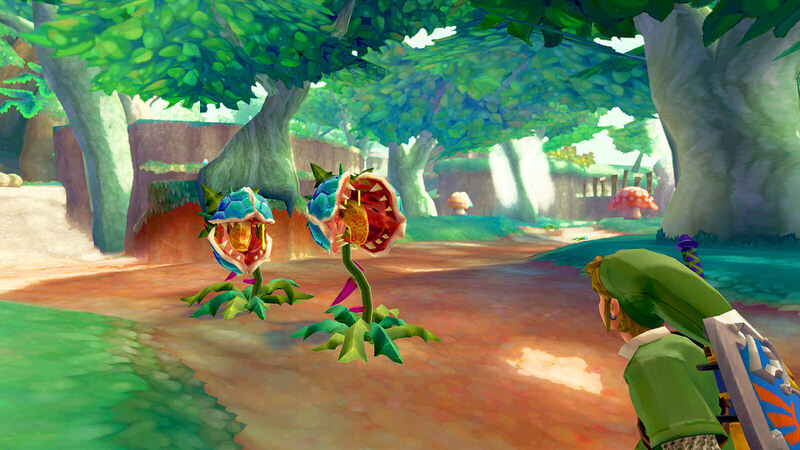 Bokoblin Leaders will use their horn to call other Bokoblin to fight, and will continue to do so until you kill it. 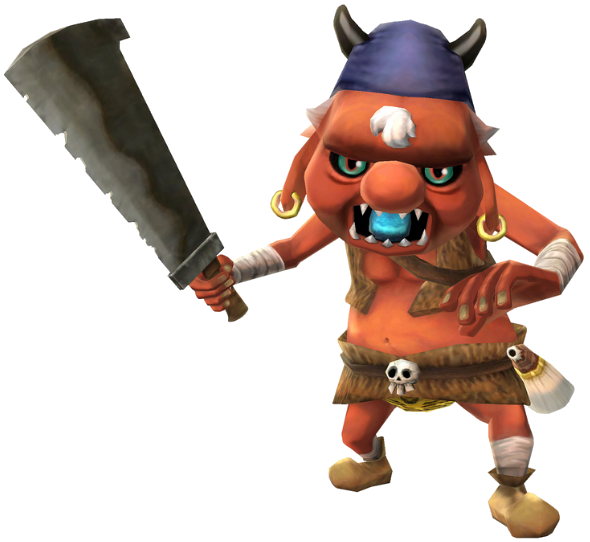 Read More about Bokoblin Leader (Blue) at the Zelda Dungeon Wiki. 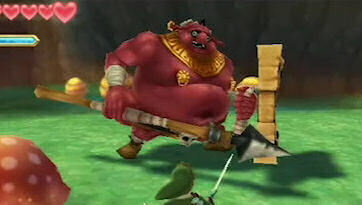 Read More about Bokoblin Leader (Red) at the Zelda Dungeon Wiki. 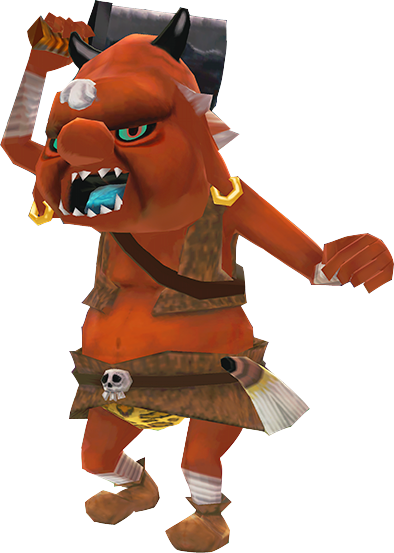 Bokoblins have a much different visual look this time around, taking on a more moblin-like appearance. They are commonly found in both field and dungeon areas. When they detect your presence, they will sprint towards you and strike at you with their sword. 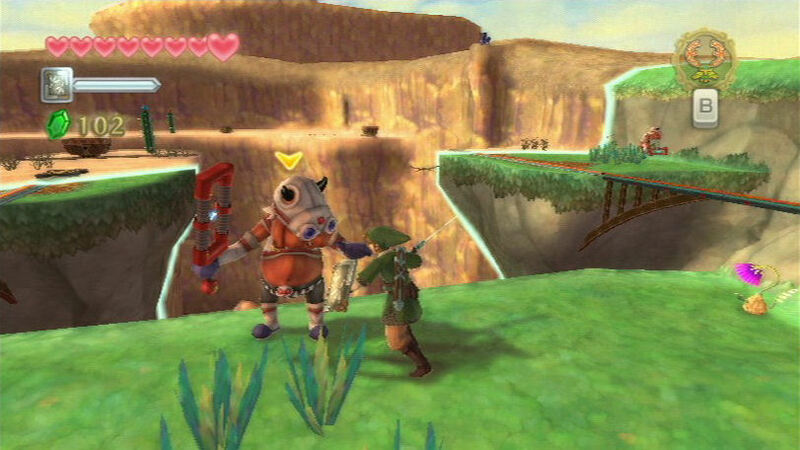 Bokoblins wield small swords and will use them to block your attacks. They will move the sword from left to right, or hold it up, blocking directional attacks from your blade. Three successful hits from the Goddess sword will defeat a Bokoblin. In the Eldin Volcano region, there is a different type of Red Bokoblin that will carry a club wrapped in vines. If you shoot a Bokoblin with the Slingshot it will become dizzy for a couple of seconds, allowing you to get in a couple of sword slashes. Bokoblin are afraid of bombs and the Beetle, so if Link either carries a bomb or flies the beetle towards them, they will run away. This aquatic Chuchu can only be found underwater. They will hop onto Link's head and attempt to suffocate him until he shakes them off. They can only be defeated by using a spin attack to spin through them. Read More about Chuchu Blue at the Zelda Dungeon Wiki. The small variant of this Greenish blue Chuchus is first found in the Waterfall Cave on Skyloft. It will slowly move towards you, then gnaw on your leg when it gets close enough. One sword slash is enough to kill it. The large variant is found in both Skyloft and the Ancient Cistern. Hit them with a vertical sword slash to separate it into two parts, then kill each part individiually. Read More about Chuchu Green at the Zelda Dungeon Wiki. Encountered in the Eldin region, this glowing version of the chu is much like its counterparts. They come in three different sizes: Large, Regular, and Small, making the difficulty of them vary. Just like all other chus, they need to be hit multiple times with the sword to be defeated. 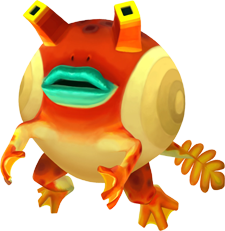 Read More about Chuchu (Red) at the Zelda Dungeon Wiki. These electrified chus are found in the Lanayru region. They will become electric for a few seconds, then act like normal chus for a few seconds after. To not take damage, Link must only attack them when the chus are not electrified. 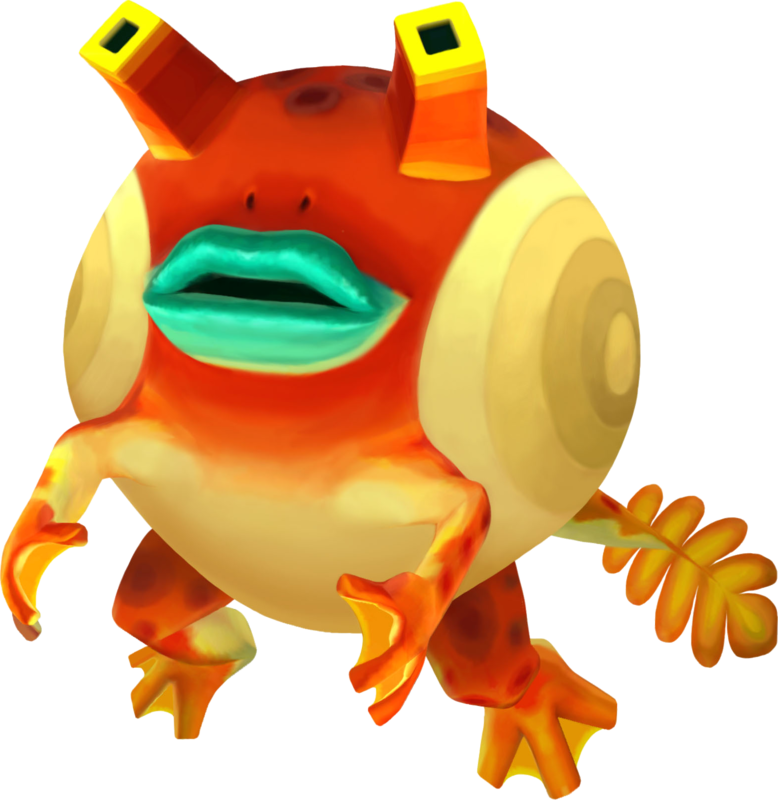 Read More about Chuchu Yellow at the Zelda Dungeon Wiki. This fishlike monster is said to settle disputes with another of its species purely by the magnificence of its bulbous crowns. When this creature chooses its prey, it will turn red with excitement and charge head-on. To defeat it, you must spin attack into it, causing it to flip over, stunned. You must then perform another spin at the "X" on its head, killing it. 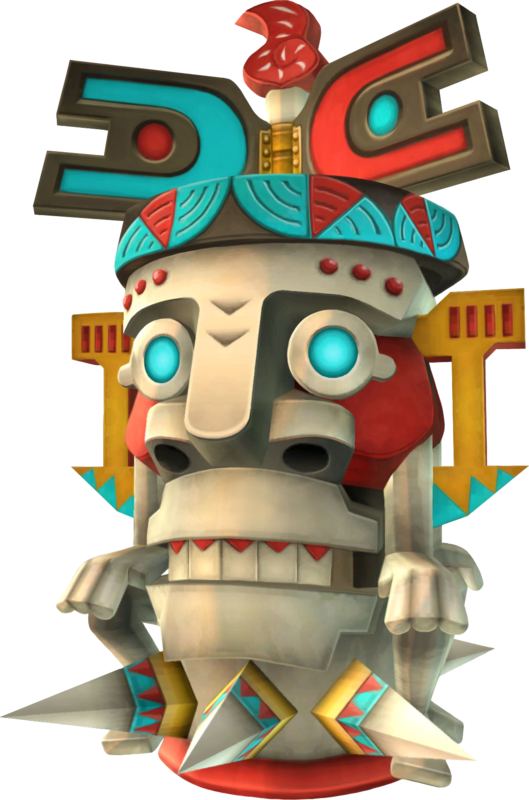 Read More about Cranioc at the Zelda Dungeon Wiki. 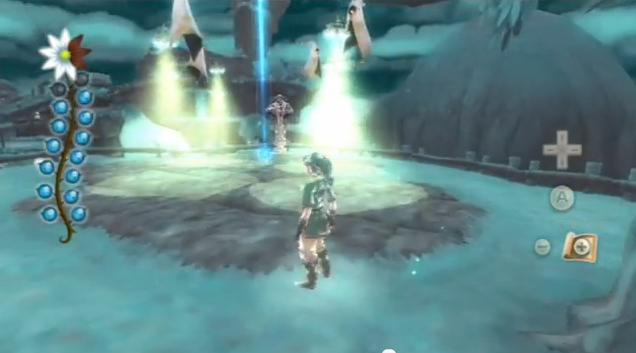 Deku Babas greatly resemble their appearance from previous Zelda titles. They come out from underground and try to bite Link if he gets too close. 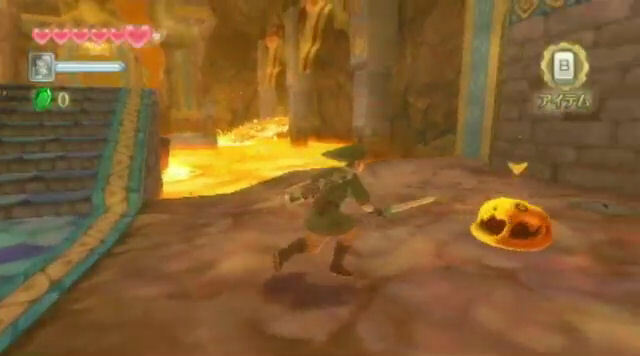 A new feature is that when battling the Deku Babas, Link must slash in the direction that the enemy's mouth is open. Some Deku Babas need to be sliced vertically while others need to be sliced horizontally. Alternatively, Link can toss or roll a bomb towards a Deku Baba and it will gobble it up before exploding within its mouth. 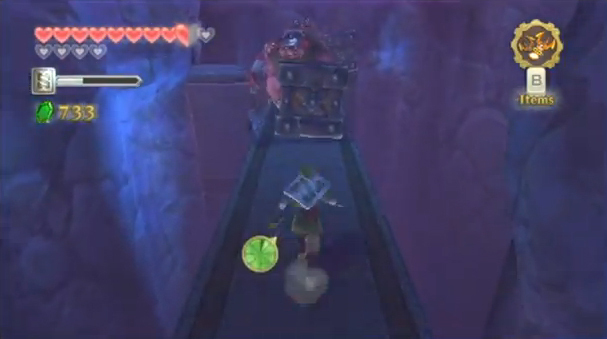 Some Deku Babas can be seen hanging from walls or the ceiling and they are out of reach from Link's sword. 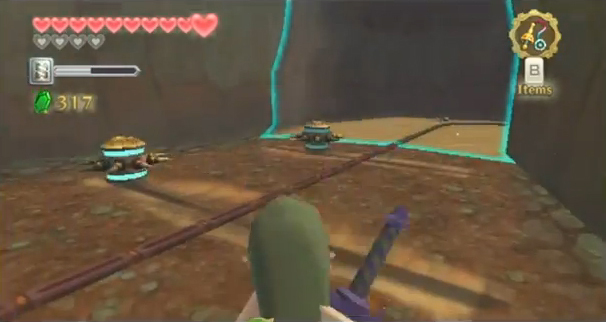 In order to defeat these fellows, Link must use the beetle or arrows. 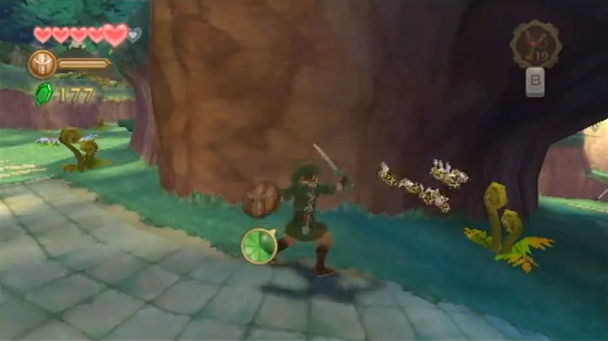 After sending out the beetle, Link can track its direction so that it cuts down the deku babas from their stems, causing them to fall to the floor in defeat. 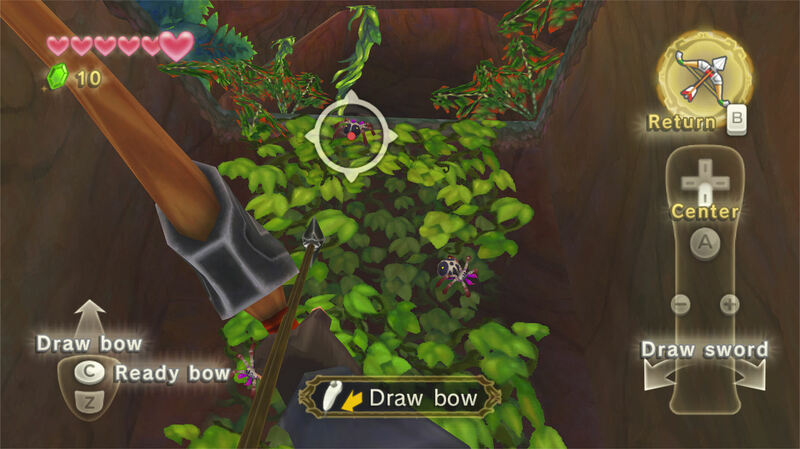 Link can also use his bow and arrow to cut these deku babas from their stem, or shoot them in the mouth to kill them directly. 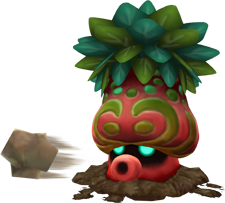 Read More about Deku Baba at the Zelda Dungeon Wiki. These creatures float close to the ground in the Silent Realm. They carry a lantern, and will alert the Guardians to Link's presence if he steps in the lantern's light. 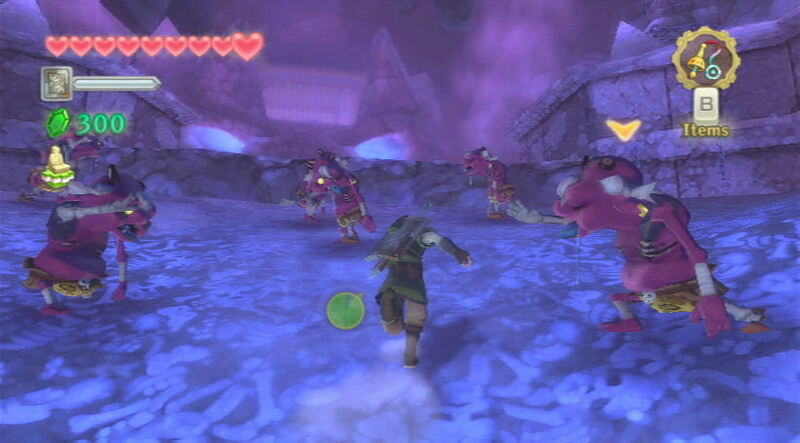 Read More about Earth Watchers at the Zelda Dungeon Wiki. Eye Guardians are eyes found on the walls of the Skyview Temple. Only found near doors, defeating them will open up the door they are near. To defeat them, Link must spin his sword around in a fast circle, confusing the Eye Guardian and killing it. Eye Guardians can come alone, or two to three at once. All must be defeated at the same time to open the door. 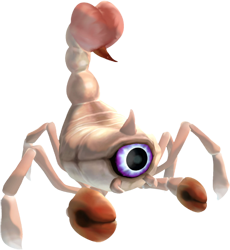 Read More about Eye Guardian at the Zelda Dungeon Wiki. The Froak is an enemy that you encounter in the Lanayru Mining Facility. It will float around aimlessly with a smooth body, but when you draw near it will shoot out the spikes surrounding its body. It will continue to float, but this time towards you, and will damage him if it makes contact. Froak will explode when attacked or killed, so the sword is not the best way to deal with them. It is better to either use a long range attack such as the Slingshot or Bow, or to use the Gust Bellows to blow them into a wall. Read More about Froak (Sand) at the Zelda Dungeon Wiki. These water-based blowfish enemies can be found in Lake Floria. They are like their sand brethren, floating around almost aimlessly until you draw near. 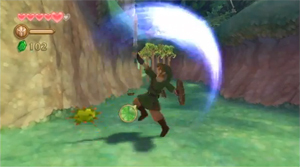 Link can kill these enemies by using a spin to hit them into a wall, causing them to explode. 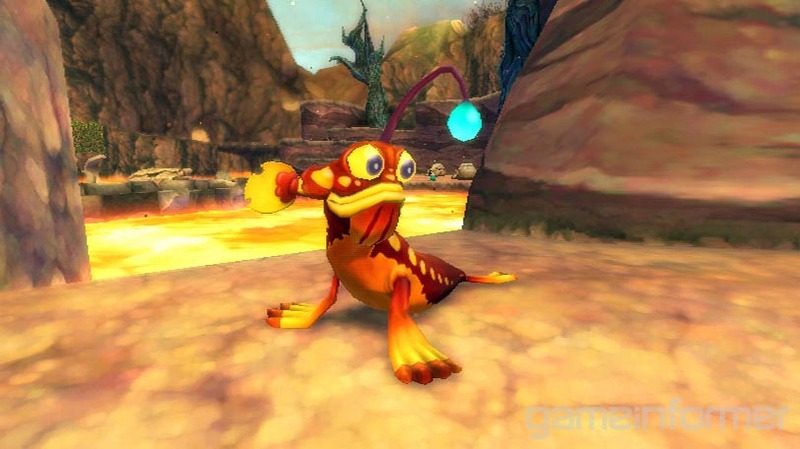 Read More about Froak (Water) at the Zelda Dungeon Wiki. These large birds are found in the Ancient Cistern. 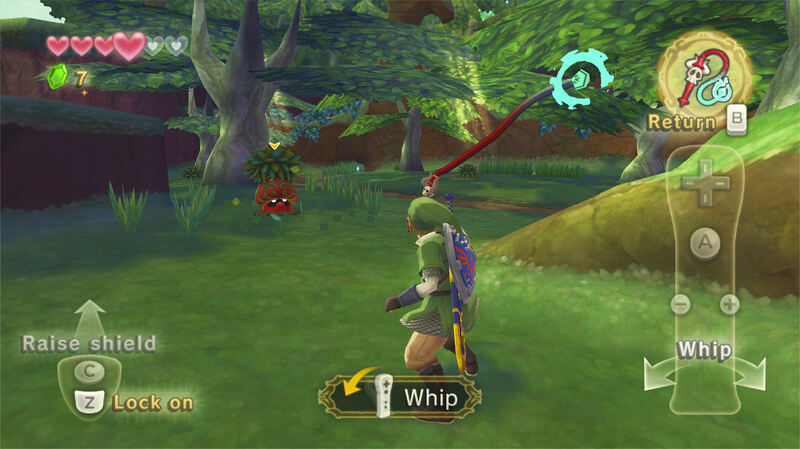 They can only be defeated after obtaining the Whip, and you will need to use it to pull the enemy down by its tail. Once this is done, you can then attack it with the sword to defeat it. 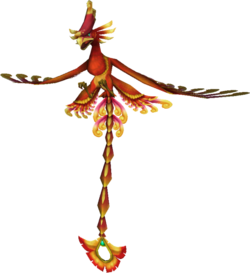 Read More about Furnix at the Zelda Dungeon Wiki. These creatures roam the Silent Realm and will kill Link in a single blow. 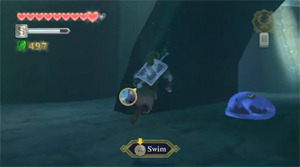 If Link steps in Waking Water or does not find a Tear in 90 seconds after starting or finding a previous Tear, they will activate and chase after him. If Link collects a Tear of Light, Earth Watchers will go inactive for a period of 90 seconds. 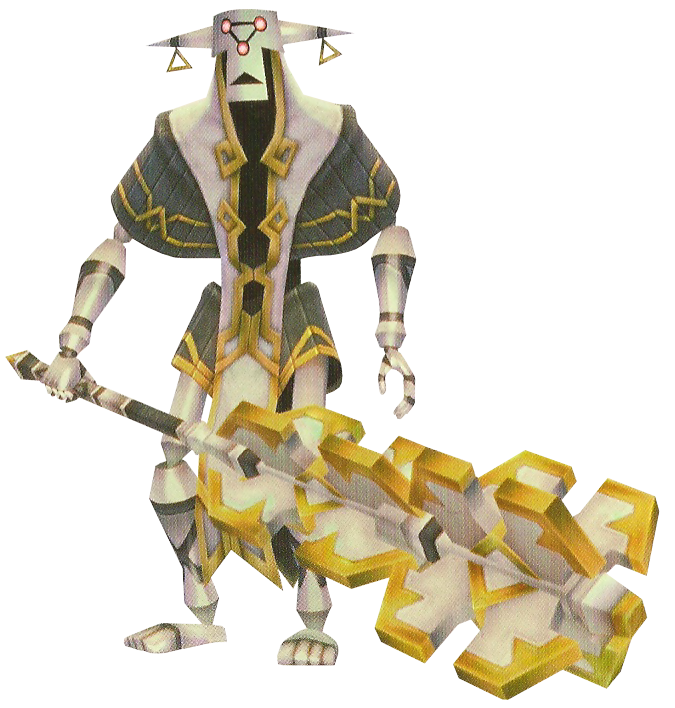 Read More about Guardian (Earth) at the Zelda Dungeon Wiki. 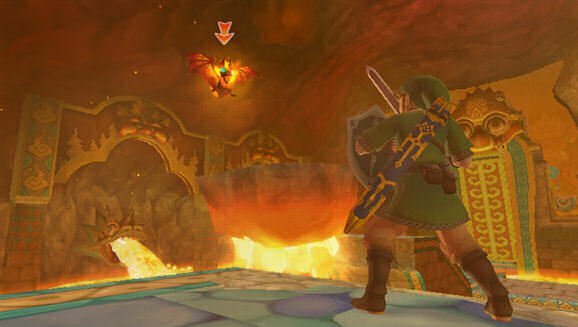 Read More about Guardian (Flying) at the Zelda Dungeon Wiki. These crow-like creatures will fly in the sky above you. They don't actually any damage, rather, they just poop on your head. You can promptly shake off this dastardly attack with your wii remote, then kill them with the sword when they come close. 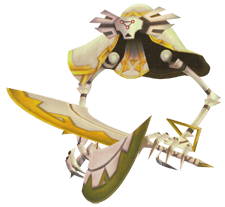 Read More about Guardian at the Zelda Dungeon Wiki. These hornets are found around nests located in the Deep Woods. If you venture close, or knock down their nest while close to it, they will chase after you and attempt to sting you. You can defeat them with a sword slash if necessary. Hornets will also chase after and bother other enemies if they are near you. They don't actually do any damage, but do help to distract them. 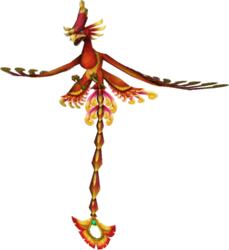 Read More about Hornet at the Zelda Dungeon Wiki. These birds will sit on top of poles, waiting for you to come close. You can defeat them from a distance with the Bow and Arrow, or by picking up a bomb with the Beetle and dropping it on the bird from above. 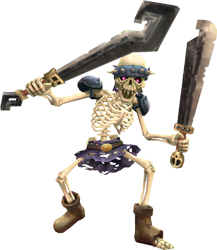 Read More about Hrok at the Zelda Dungeon Wiki. Keese serve the same purpose that they have in previous Zelda titles. 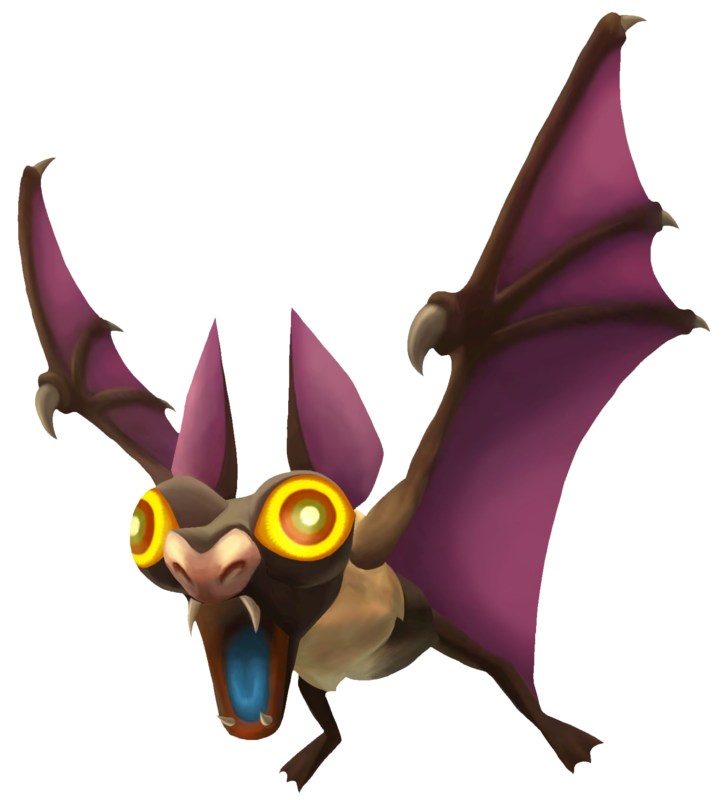 They are bat-like creatures that fly around the overworld and within dungeons with the primary purpose of trying to dive into you. When they are low enough to the surface, you can use a sword slash to defeat them. Alternatively, they can be defeated with almost any weapon that you have in your arsenal. Furthermore, you can defeat multiple keese at once with a single crack of the whip. Keese attack by diving at you to bite you, and they will only do so when their eyes turn red. Read More about Keese at the Zelda Dungeon Wiki. This rare type of Keese is only found in the Fire Sanctuary. They act much like regular Keese, but if they make contact with you they will make your items unusable for a few seconds. Fire Keese are nearly identical to their regular counterparts. The obvious difference is that they are surrounded by flames and can burn Link. If a Fire Keese contacts Link it will burn any wooden material he has while also harming Link for a period of time. Thunder Keese are found in the Lanayru region, and are electrified versions of regular Keese. They are defeated in the same way as their counterparts. Read More about Keese (Thunder) at the Zelda Dungeon Wiki. Lizalfos resemble lizards with human-like attributes. They wield wooden shields, which they can use to block your attacks. They can simply block your direct attacks or hide under their shield for even greater protection from your blade. They can be defeated with the sword, bombs, or arrows. 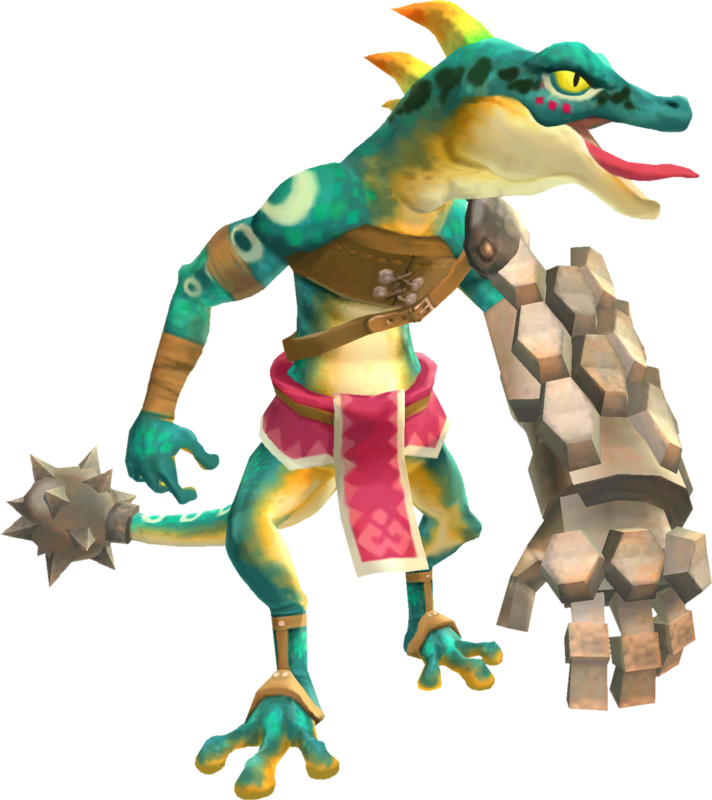 Read More about Lizalfos at the Zelda Dungeon Wiki. Dark Lizalfos are enemies that appear in the Ancient Cistern. They are more powerful enemies than the regular Lizalfos. 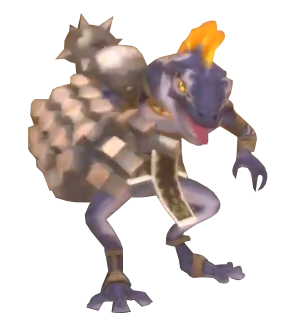 Read More about Dark Lizalfos at the Zelda Dungeon Wiki. 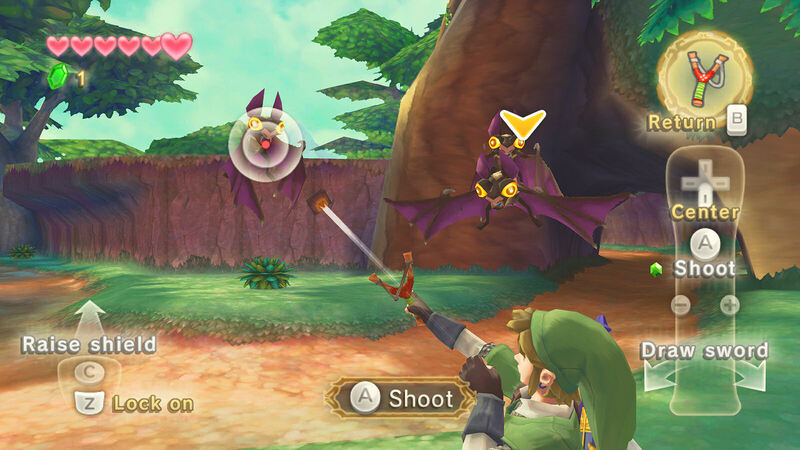 A Wooden Shield Moblin is a giant purple monster that holds a spear and a large wooden shield. The moblin uses the shield to block your attacks, although it isn't very sturdy. You can slice the shield into pieces, leaving the moblin vulnerable to sword attacks. The moblin's primary attack is using its spear to wind back and deliver a thrusting blow at you. You can quickly dodge the attack and deliver a counter sword slash during the recoil period. 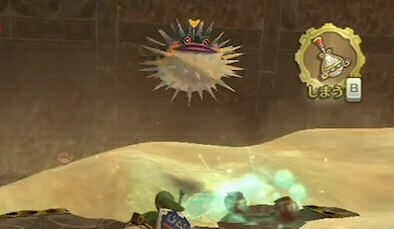 Read More about Moblin (Wooden Shield) at the Zelda Dungeon Wiki. 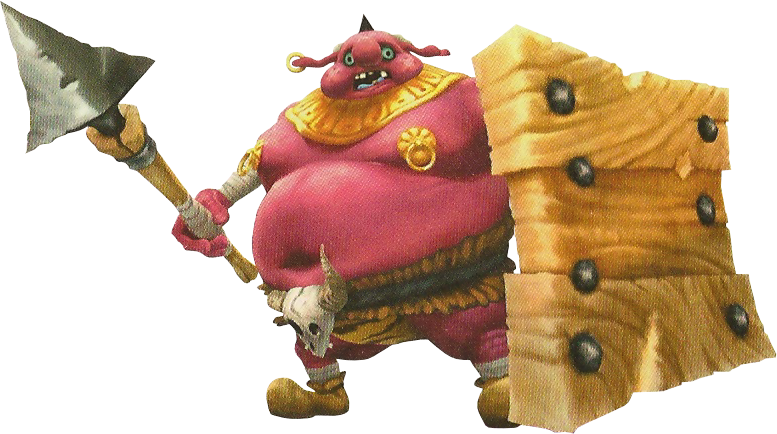 An Iron Shield Moblin is a giant purple monster that holds a spear and a large Iron shield. The moblin uses the shield to block Link's attacks, and it is much sturdier than the wooden shield. The moblin's primary attack is using its spear to wind back and deliver a thrusting blow at Link. Link can quickly dodge the attack and deliver a counter sword slash during the recoil period. 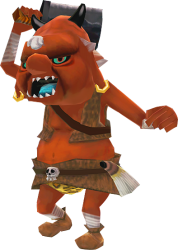 Read More about Moblin (Iron Shield) at the Zelda Dungeon Wiki. Myu are spikey green balls that are found in the forest of Faron and in Skyview Temple. They will latch onto your leg when you step on them, and will stay there until they are shaken off or they explode. This is the only way they attack, and will not harm you if you stay far enough away. From a distance, you can use the Slingshot or the Bow to kill them. If this is not an option, you can also slash at them with the sword from a distance to start the countdown until they explode. 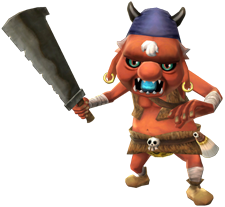 Read More about Myu at the Zelda Dungeon Wiki. 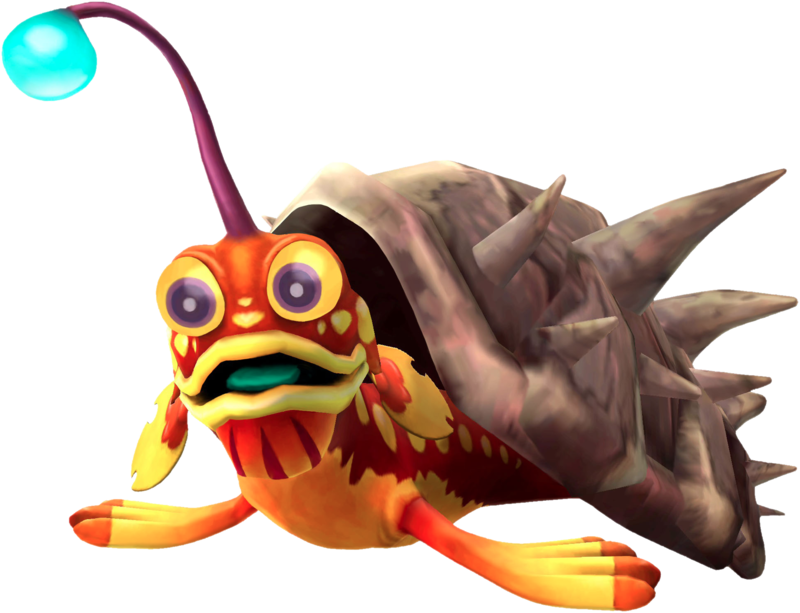 Octoroks are now land creatures that do not resemble their counterparts from older 2D Zelda titles. They also have some similarities to deku scrubs from previous Zelda games. Octoroks will shoot rocks towards you, but whenever you comes close, they will hide under patches of grass. In order to defeat an octorok, you can deflect the rocks back by lunging your shield forward knocking the rock back towards the enemy. You can also use the sword to slash the rock back, or use the whip to pull the octorok up from underground for a short period of time, allowing you to slash away with your sword. 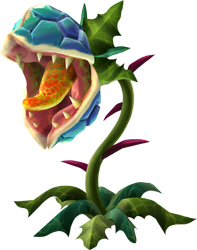 Read More about Octorok (Grass) at the Zelda Dungeon Wiki. These types of Octoroks are found in the present Lanayru Desert. They hide under a rock, and will only lift it up when you are far enough away. They shoot rocks like all other Octoroks, which can also be deflected back at them. If you have no shield to deflect with, you can also roll a bomb at the Octorok or rock to kill it instantly. 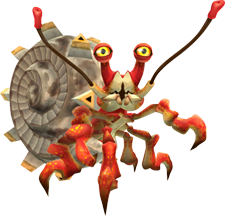 Read More about Octorok (Rock) at the Zelda Dungeon Wiki. 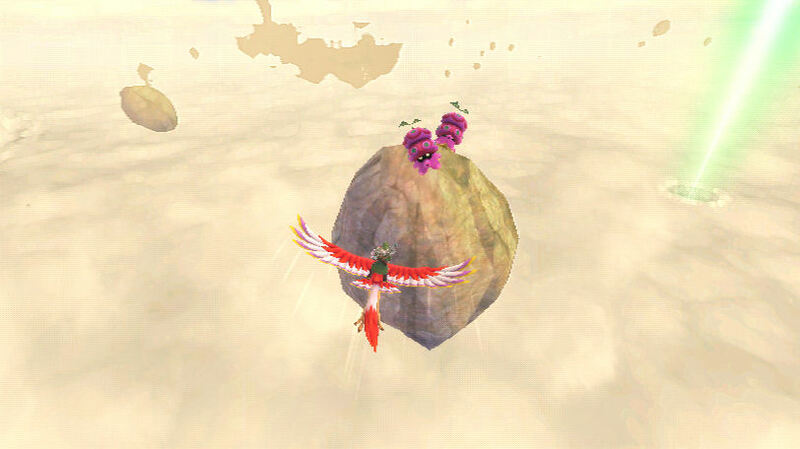 Sky Octoroks can be seen on various island floating within the Sky. These Octoroks shoot rocks at you while you are flying in the Sky, and are very accurate in doing so. They are much large than other octoroks, and they can be defeated by dashing into them with the A button. 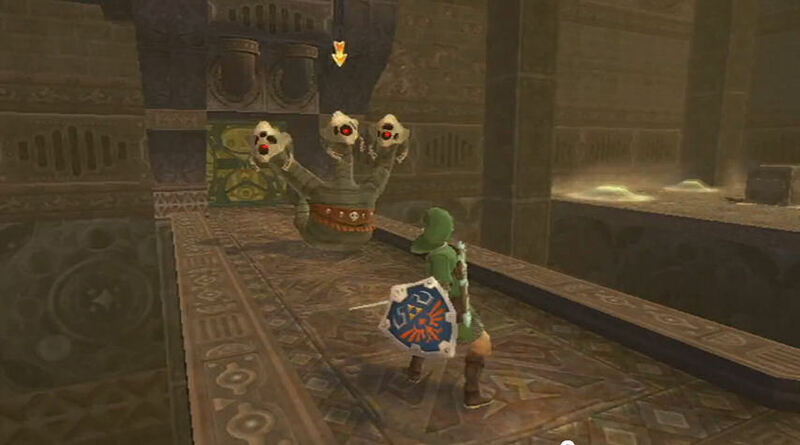 Read More about Octorok (Sky) at the Zelda Dungeon Wiki. Pyrups are tiny seal-like creatures that hide inside walls or beneath rocks. They have a single antenna hanging from its head, the function of which is currently unknown. 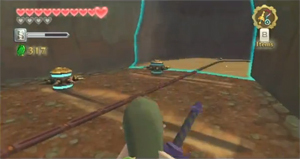 They attack by spraying a line of fire towards Link, and can also obstruct Link's path in this manner. They can be defeated by throwing a bomb into the hole in the wall they hide in or the rock they hide beneath, killing the enemy in the process. 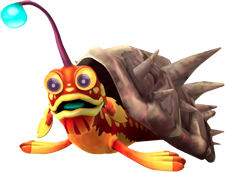 Read More about Pyrup at the Zelda Dungeon Wiki. The Quadro Baba is a stronger variation of the standard Deku Baba. It will attack you in the same ways as a standard deku baba by lunging towards you, attempting to bite you. Its mouth is divided into four parts, rather than the two halves that a standard deku baba will have. This will allow the quadro baba to alternate directions in which its mouth opens, meaning you will have to slash either horizontally or vertically, depending on how its mouth is open. Additionally, unlike standard deku babas, quadro babas take multiple hits to defeat and can be quite challenging. 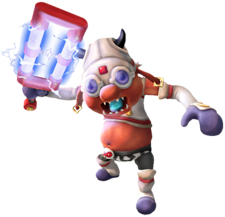 Read More about Quadro Baba at the Zelda Dungeon Wiki. During the day, Remlits are normal cat-like creatures, but at night they turn into aggressive monsters that will attack you. You can't actually kill a Remlit, rather, hit it twice with your sword to stop it from attacking you. If you throw a Remlit after making it passive it will attack again, and the same will happen if they fall off the edge of Skyloft and fly back. 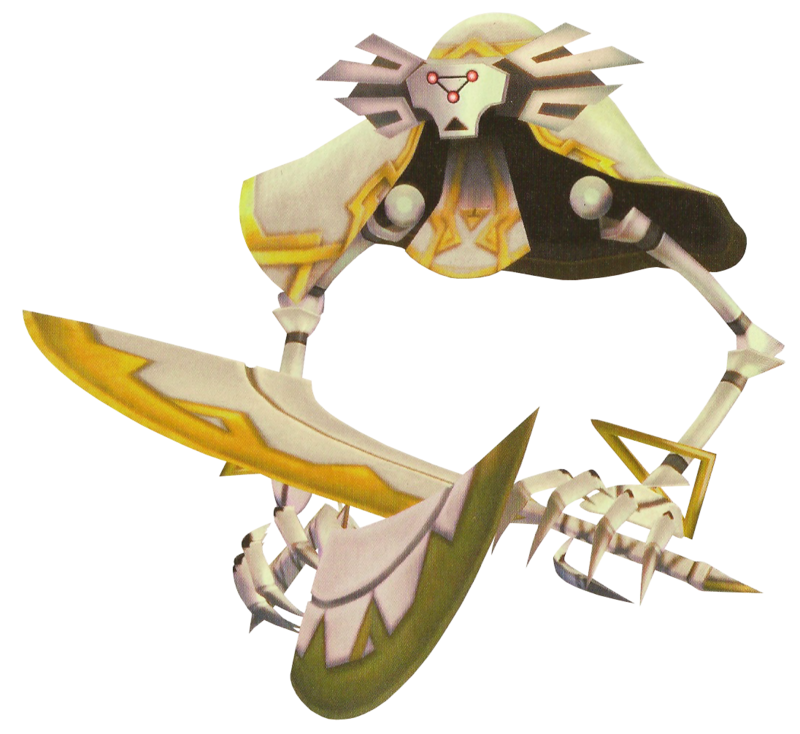 Read More about Remlit at the Zelda Dungeon Wiki. Sentrobe are flying creatures who have large eyes in the center of their bodies, with large shells on each side of the eye. The propeller on the top of its body make it appear to be a part of the Peahat and Seahat family. They will shoot rocks out of their eye to attack you, but you can deflect these back with your shield to kill the Sentrobe. Sentrobe will also bring out two smaller enemies called Sentrobe Bombs that will fly towards you and hover for a moment before exploding. You will need to either horizontally or vertically slash them, depending on where the line through its body is located. 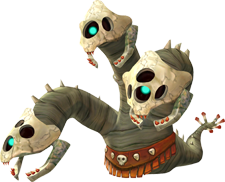 Read More about Sentrobe at the Zelda Dungeon Wiki. Sky Watchers work in tandem with the Earth Watchers to protect the Silent Realm. These Watchers are high in the sky and will chase after you if he draws too close. If you pass through this light, the Sky Watchers will set off a very loud sound. This will awaken the guardians and erase any protection time of the Tears of Light. 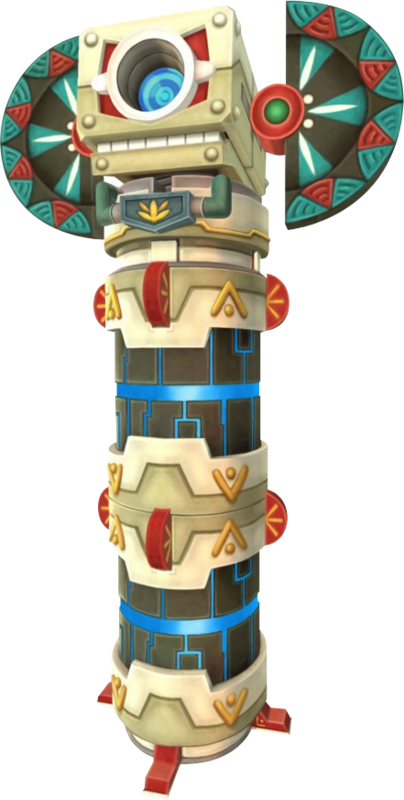 Read More about Sky Watcher at the Zelda Dungeon Wiki. 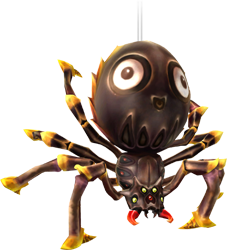 Skulltula appear very much like their Twilight Princess predecessors. They are spider-like creatures with eight legs whose main attack is to dash its body towards Link. Skulltulas will appear in several different ways. Some just drop down the ceiling, others are hanging from a string, while some have full blown spider webs created to block your path. You can knock down skulltulas by breaking the string or spider web utilizing the beetle. Once a skulltula is on the ground, you can then use an upward slash to knock the Skulltula on its back, revealing its weak spot. You can then use a fatal blow to kill it in one hit. 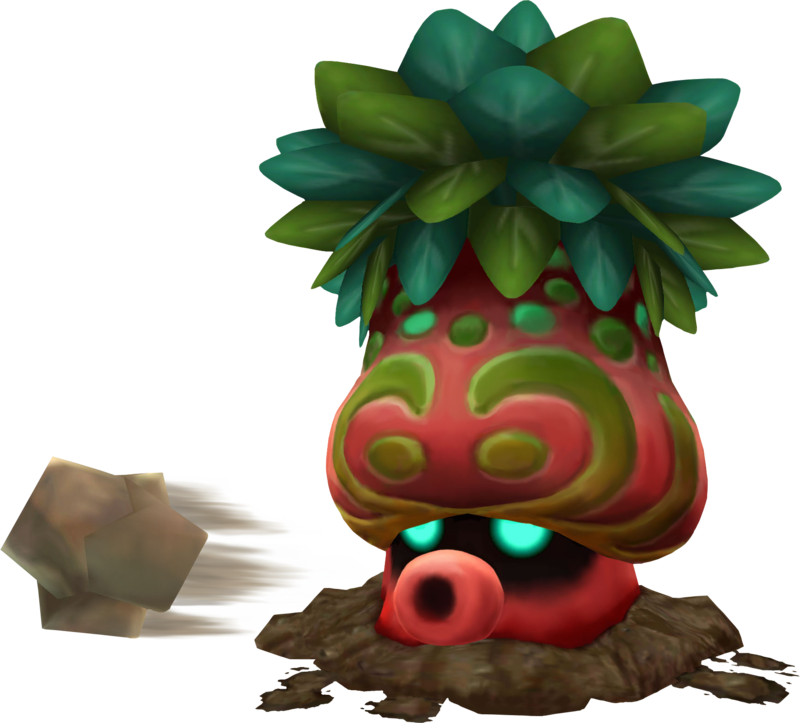 Read More about Skulltula at the Zelda Dungeon Wiki. Cursed Spume can be found swimming in poisonous swamps. You can hit them with an Arrow shot to defeat them. 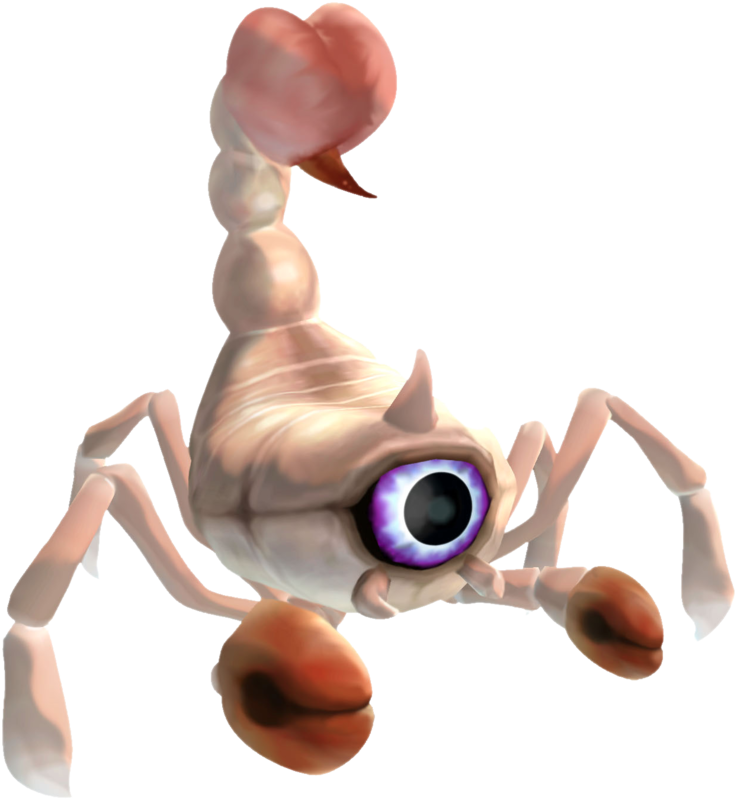 Read More about Spume (Cursed) at the Zelda Dungeon Wiki. Electro Spume can be found in the Lanayru Desert and Mining Facility sand. You can either roll or throw a bomb at them, or use an arrow to kill them. Read More about Spume (Electro) at the Zelda Dungeon Wiki. Magma Spume can be found swimming in pools of lava. They will hop up from the lava to spit out a fireball towards you. These fireballs can be deflected using your shield to bounce them back. You can also use his sword to hit the fireballs, causing them to dissipate. Since this enemy is found in lava, you cannot use his sword to defeat them. Instead he will have to rely on projectile weapons such as the bow and arrow. Read More about Spume (Magma) at the Zelda Dungeon Wiki. Staldra is a dragon-like enemy with three heads. To defeat Staldra, you must use a single sword slash to attack all three heads in a row. If you only hit one or two of the Staldra heads, then the chopped off heads will quickly grow back, restoring Staldra to full life. Each of Staldra's eyes are a Electricish-blue color. However, when you come near, the eyes of Staldra will turn red and it will dash forward trying to attack you. This can easily be avoided by just taking a step back or utilizing your shield. 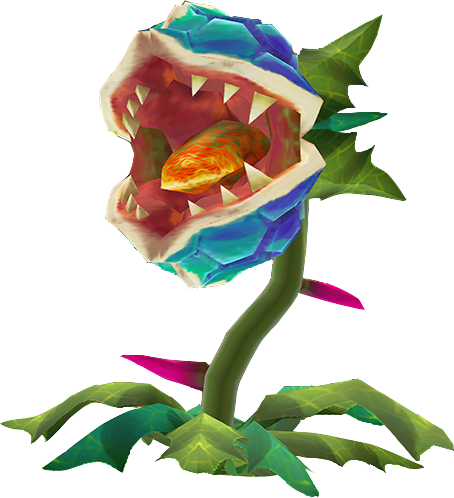 Read More about Staldra at the Zelda Dungeon Wiki. 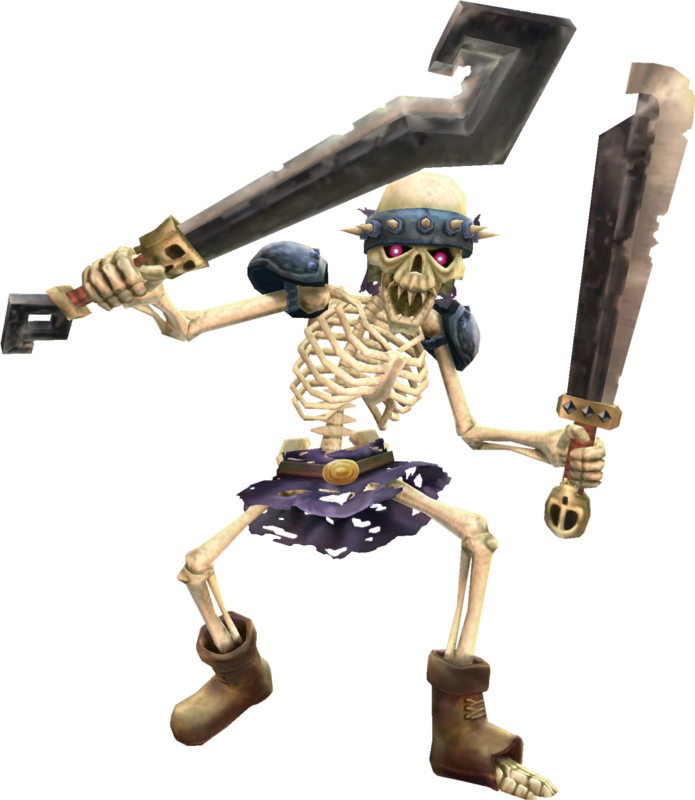 Stalfos are skeleton-like enemies that wield two large swords which they use both to block and to attack. You must attack from specific directions that are unprotected, requiring good timing and accurate sword slashes. Stalfos has three main attacks. It will quickly swing one sword horizontally, perform a cross-chop with both swords, or raise both swords above its head in preparation for a powerful two-part attack. The Stalfos is defenseless while its swords are above its head, so this is your chance to run around behind it and slash away. 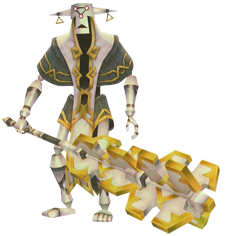 Read More about Stalfos at the Zelda Dungeon Wiki. Stalfos Warriors look almost exactly like regular Stalfos except with some minor visual changes. They now have a small cap on their head with a plume hanging down from it, much like their appearance in Phantom Hourglass and Spirit Tracks. The first phase of a battle with a Stalfos Warrior is identical to the battle with an ordinary Stalfos. They have two arms wielding large swords that will block your attacks. You must aim in specific directions with sword. After a number of hits, two more arms will emerge from the stalfos, with one holding another sword, and the other a massive axe. The three swords will now block three directions, forcing your attacks to be more precise in order to harm the stalfos. The stalfos will use the axe, as well as the three swords to attack you. Your shield can be used to block some of its attacks and even knock off its arms. Technoblin wield large electric clubs that can be used to attack you. Their eyes are also electrified, giving the enemy a very different image. If you swing your sword and it hits the electrified sword you will take damage and be stunned for a couple of seconds. The trick is to either attack from the side it is not defending, or to wait until after it attacks, as it will be vulnerable to damage. 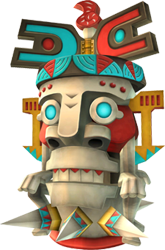 Read More about Technoblin at the Zelda Dungeon Wiki. Walltulas are small spiders that can found crawling on vines. Their backs have a skull-like image which puts them in the skulltula family. Since they are found on walls and vines, they cannot be defeated using the sword. Instead, you must use a projectile weapon such as the Slingshot or Bow and Arrow. 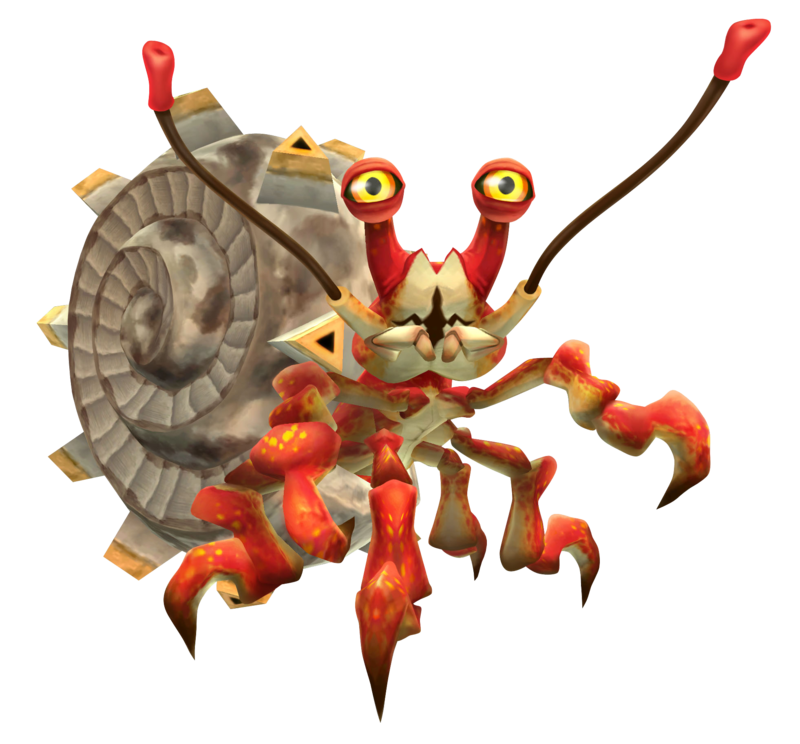 Read More about Walltula at the Zelda Dungeon Wiki.